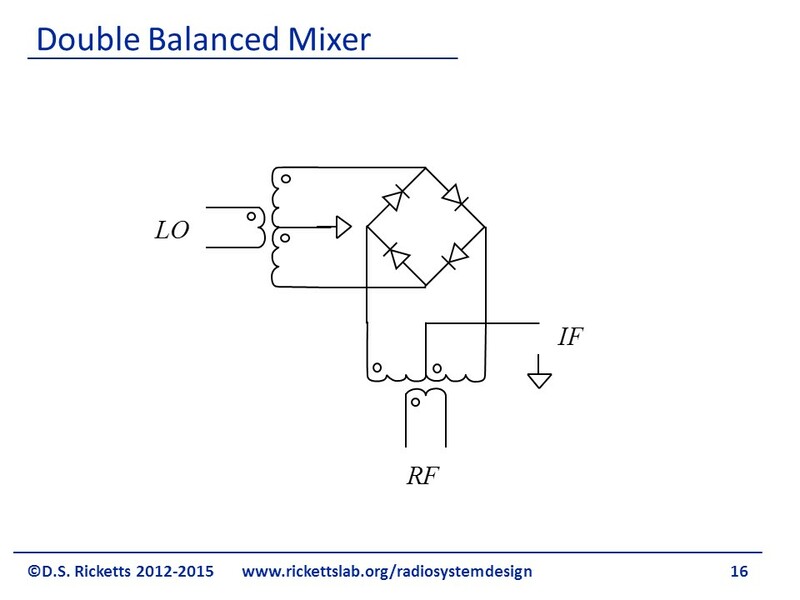 The double balanced mixer is a diode bridge mixer that uses two single-ended to differential transformers, or baluns, to create the multiplication of two input frequencies and cancel many of the unwanted harmonics and signals. Most notably is the cancelation (ideally) of the local oscillator and the input at several harmonics. 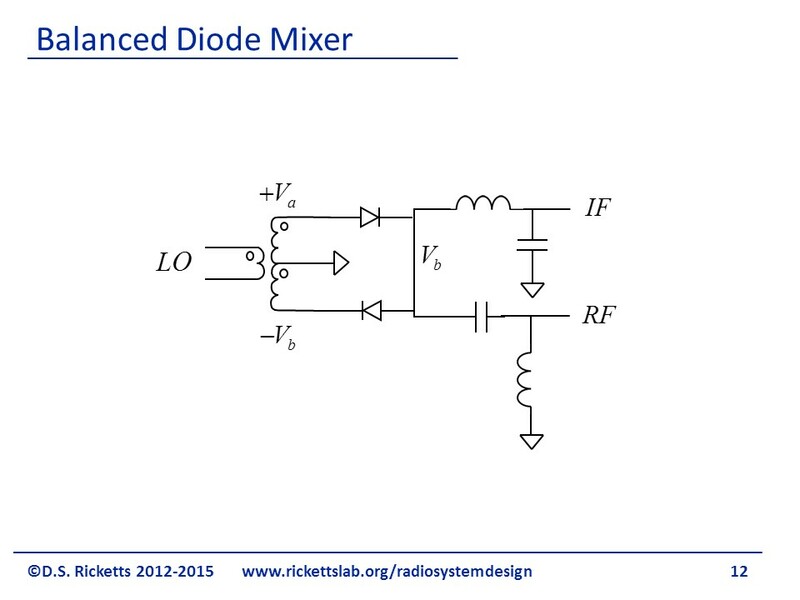 Mixers are simply multipliers of voltages and/or currents. While we may mathematically thing of them as multipliers, there is no circuit element that directly “multiplies” signals. 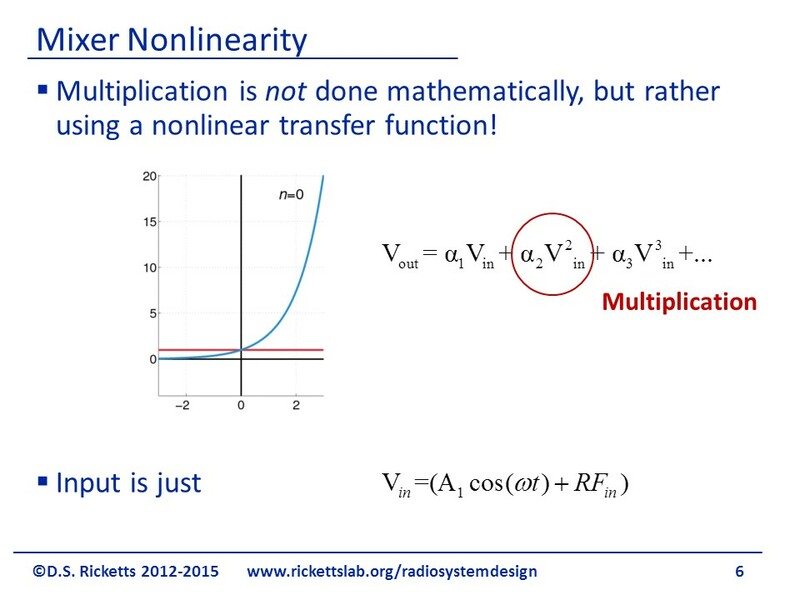 To achieve multiplication, we use a nonlinear element that has a strong second order term in its Taylor series. Other terms from the Taylor series could be used but generally the amplitude of the coefficients are small. 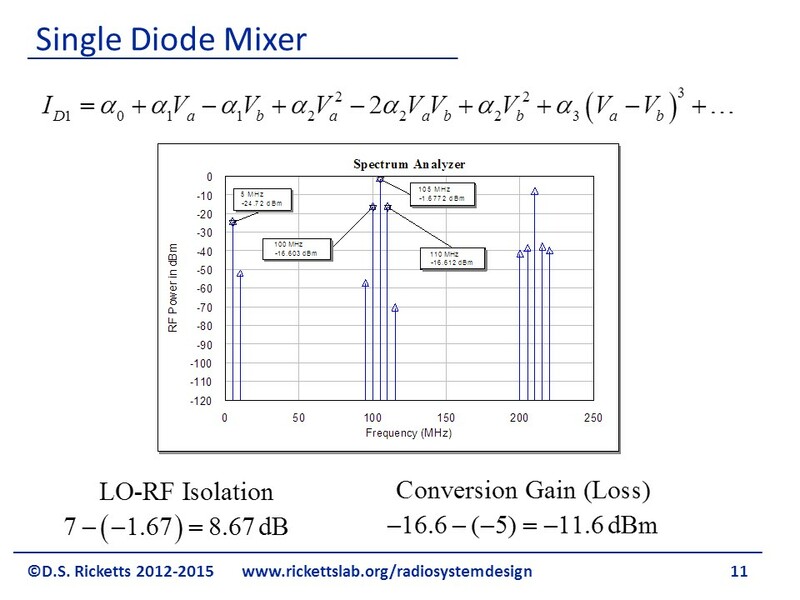 The input is generally the sum of the local oscillator (LO) and intermediate frequency (IF) for an up converting mixer, or an LO and RF signal for a down converting mixer. In this example, two inputs, A1 and A2, are inserted into a Taylor series. Many terms are created. We focus on the one in red, as it will have the strongest contribution since 2 is larger than higher order coefficients. Important in this derivation is that there are many harmonics generated by using this nonlinearity to perform multiplication. 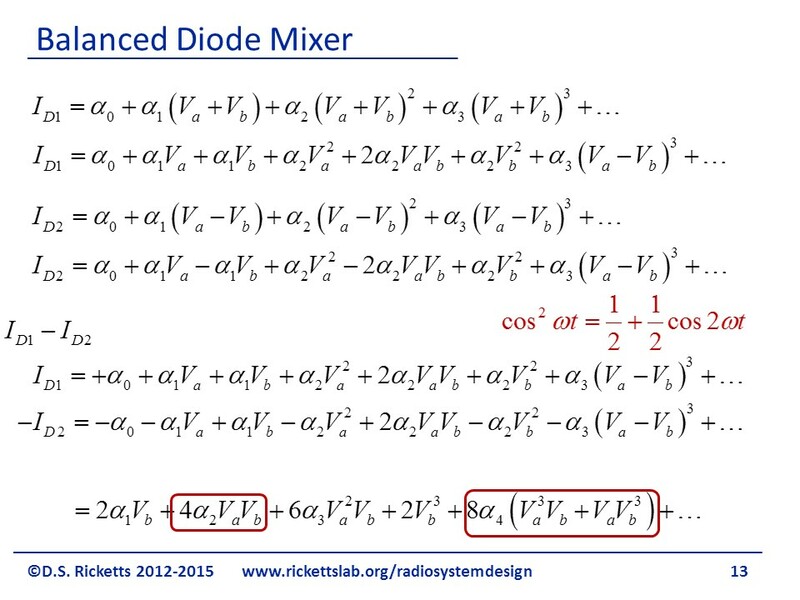 Eliminating or compensating for these harmonics will be one of the main challenges in designing a diode mixer. To illustrate, we look at a simple diode and examine the current through it, resulting from the voltage across the device. The voltage is due to the LO and either the IF or RF (either could be the stimulus). 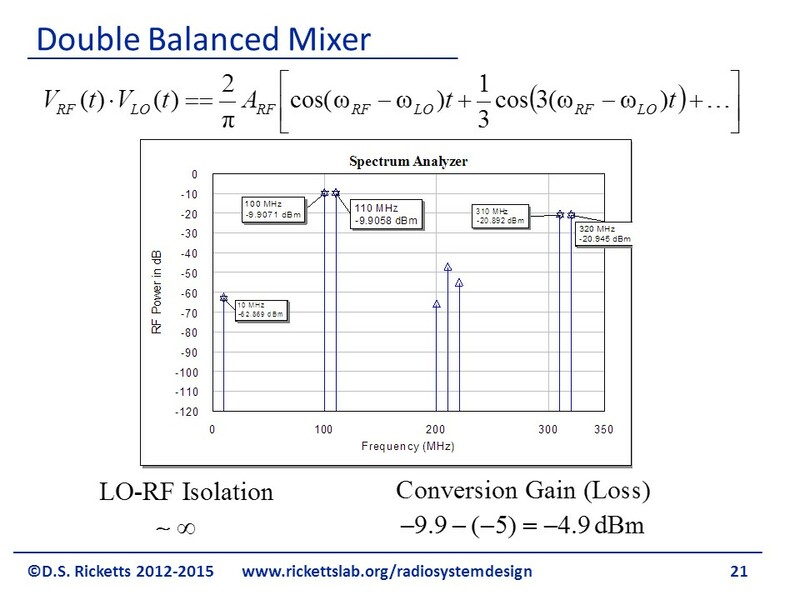 Let us assume we have an IF of 5 Mhz and an LO of 105 MHz and the RF port is the output (an upconverting mixer). The series expansion (assuming 0=0) gives us current at the following frequencies: the LO (term 2), the IF (term 3), a dc component and one at twice the LO – see identity in figure (term 4), the desired RF at LO±IF (term 5), a dc component and one at twice the IF (term 6) and then term 7 provides several harmonics and a signal at our LO±IF, which arises since due to a term when one expands term 7 and uses the identity in red. This term is expected to be very small due to 3. The main takeaway – we achieved our signal multiplication, but with it also have many harmonics. The simple LC filter separate the low frequency from the high frequency through the IF and RF ports. The resulting power out of the RF port is shown in the figure. The LO power is 7 dBm and the IF is – 5dBm. The mixer achieves the desired LO±IF signals at 100 and 110 MHz, however the conversion gain is quite low, -11.6 dBm (a loss). Also seen is that the LO is very strong on the output, with only 8.67 dB of isolation. In addition we can see the IF signal and the harmonic at twice the LO as described before. While it may be possible to use the low-power RF signals and compensate in the system for the large LO, it would be desirable to remove the LO contribution. 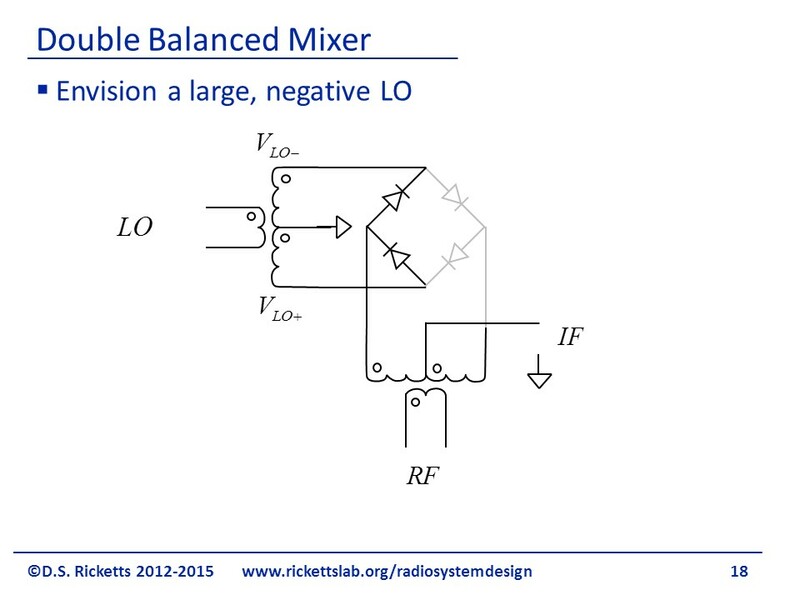 The balanced mixer uses two diodes, in opposite polarities, to cancel the LO component. The transformer in the picture is a balun, and simple converts the LO from single ended to differential. The mathematics for calculating the difference in diode currents is detailed, but straight forward. Looking at the lower portion, we can see that we have achieved our desired multiplication. In addition we can see that Va and (Va)2 has disappeared through simple cancelation. The spectrum at the RF port looks very different now. The components at the LO and twice the LO are now very small. 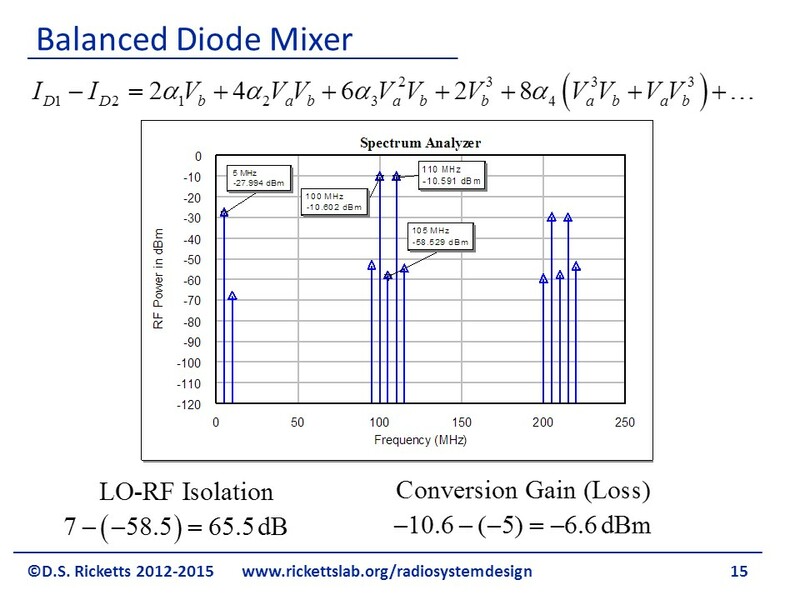 LO-RF isolation is 65.5 dB. The conversion gain is also improved to -6.6 dBm, which can best be understood as having twice the amount of signal with two diodes. We still have some harmonics, including the IF at the output. 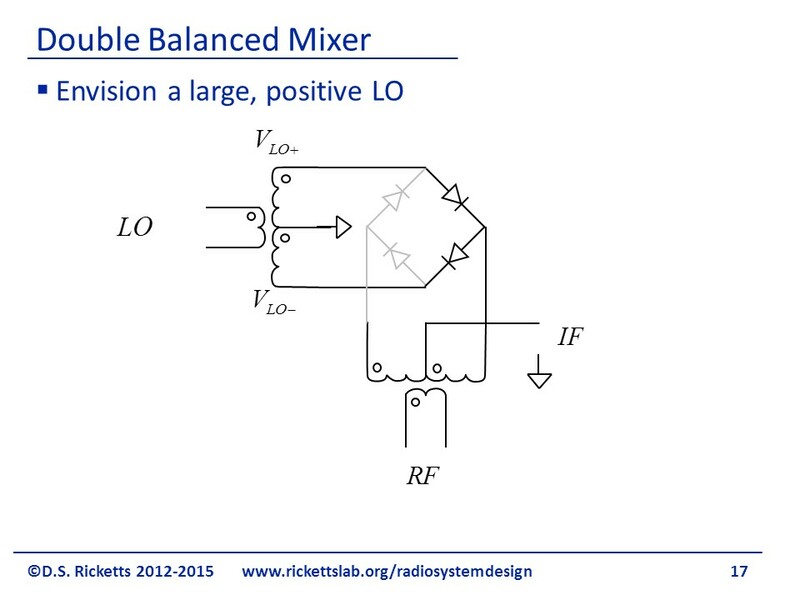 The double balanced mixer provides similar IF cancellation as did the balanced mixer for LO. Instead of the detailed mathematical analysis, we can look at the operation for a large LO and treat the diodes as switches. When they are forward biased, the signal passes through them. When they are reversed biased, they are off. 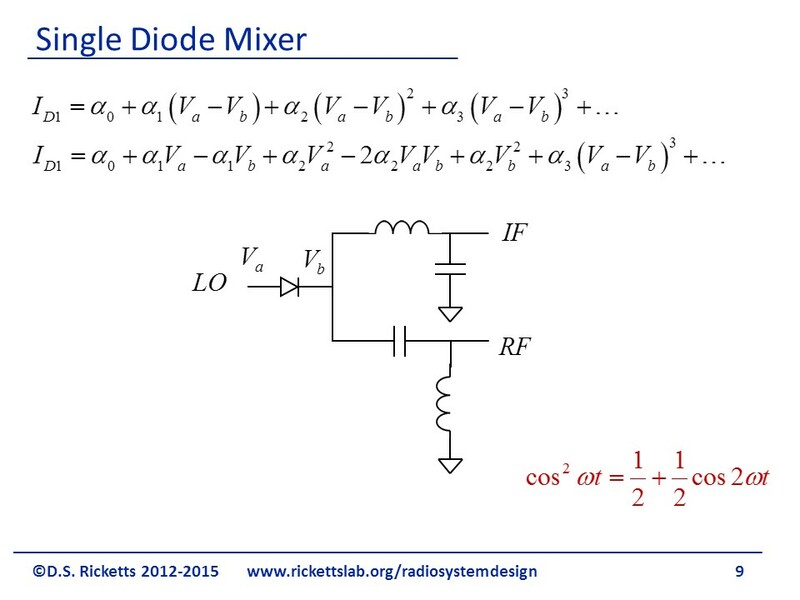 This way of thinking works only if the LO is much larger than a diode forward bias voltage. With the LO in the polarity shown, the left two diodes are on. We will consider an upconverting mixer as it is a little easier to explain, but the mixer works both as an upconverting and down converting. The LO will hold the mid-point of the left-side diodes at approximately ground (since the LO is differential). We can make this approximation as the LO is assumed to be lower than the RF, thus we treat it as a fixed potential for the RF signal during 1/2 of the LO cycle. This means that the left side of the RF balun is ground and is thus inverted on the IF. This can be understood by thinking of the -RF signal on the non-dot side of the balun coils. On the other half of the LO cycle, the right two diodes are on and provide a ground for the non-dot side of the RF balun. The RF is then seen at the IF port without a polarity change. 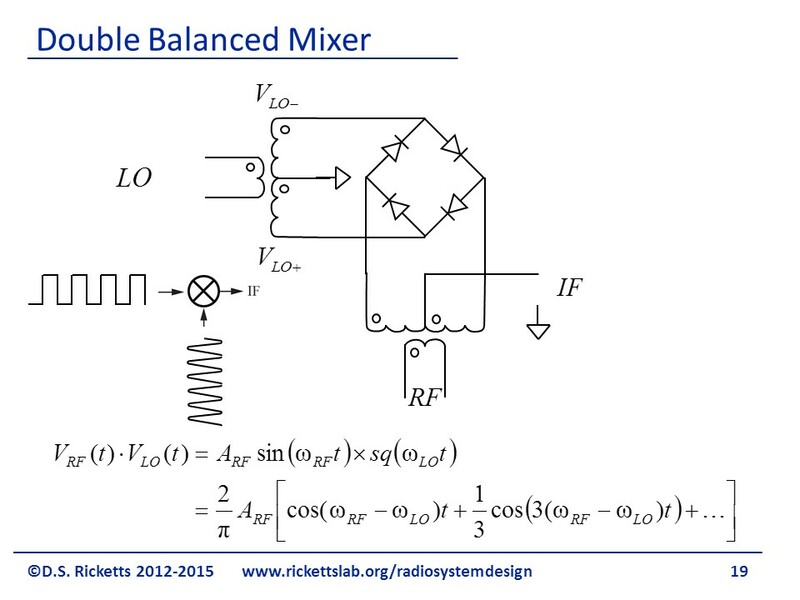 The operation of the mixer can be thought of as a square wave multiplied by the RF signal. 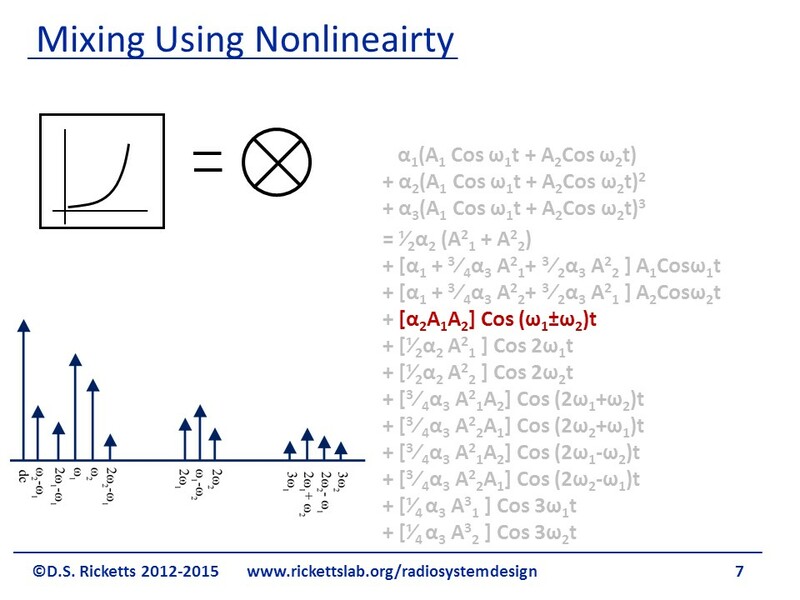 The LO basically creates an oscillating RF signal with positive and negative polarities. This is equivalent to multiplying the RF by a square wave going from -1 to 1 at the LO frequency. Using this understanding, we can expand the square wave into its Taylor series, and we immediately see that we get the multiplication of the LO and RF in the first term (we have only showed the difference, however the sum frequencies would also be present). From this expansion we can see that the IF and LO signals are removed, however there is a strong component at the 3rd harmonic. The resulting signal powers are shown here. The LO-RF isolation is perfect (in simulation) and the conversion loss is reduced to -4.9 dBm. The IF is also removed. The stronger 3rd harmonics can be seen; however they are easily filtered out.